India was one of five nations that attended their first International Cup this year. Two thirds of the team flew in from Kolkata, India with the rest of the squad Indian students already in Australia. WFN spoke to team captain Mario Shelton about his journey to Melbourne and his plans for the game back home. 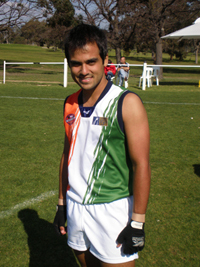 "It all started for me when the AFL India Chairman, Mr. Sanjeev Nagar and other AFL India members approached La Martiniere Old Boys Rugby Club Captain and Coach, Mr. Tony McCluskie one Saturday afternoon. Mr. Nagar explained that they planned to start a footy program in India with the help of the AFL and Australian expats and that they needed to build a side to represent India at IC08. He had received an anonymous tip that AFL would spread like wild fire in Calcutta because of its great rugby history and popularity and since prior efforts in Delhi and other states failed they decided to give it a shot! Mr. Tony McCluskie spoke to me and a few other players and asked if we were interested and I thought this was a great opportunity not only to learn a new sport but also move beyond the barriers of Rugby, which I had been playing for the past 12 years, and discover the unknown. Before we knew it, practice sessions and selections had begun at the YMCA ground under the supervision of Mr. Ravi Chadha. A few weeks later we were told that an AFL development officer, Yuta Kobayashi was coming down from Australia for 3 weeks to teach us the game, equip us with the required technical skills and knowledge and to help out with selection process. We had players from various sporting backgrounds; rugby, basketball, soccer and kabaddi, all eager to learn this new sport. As IC08 drew closer, selections were done and our Coach Mr. Raja held training sessions three times a week; Monday, Wednesday and Friday. Sixteen players were selected to represent India at IC08 and the day before we left I was named Captain and was informed that a few students from Melbourne would join our team. Finally our bags were packed and we were set to go. For most of the boys it was there first time flying so they were real excited. We reached Australia and I knew our journey had begun. It wasn't going to be easy, but it wasn't impossible either. I was real proud of representing my country once again, previously for Rugby (China 2004 & Pakistan 2005) but this time it was a whole new ball game, literally!! I have some great memories from my tour to Australia. I'll never forget the feeling of running through the tunnel onto the field at Telstra Dome for the press conference. It weakened my knees and I felt sick in my stomach, but it was the most wonderful feeling in the world! The press Conference was followed by a Lunch with the AFL Commission and Mr. Kevin Sheedy and a few other officials. It was then I realised what I was getting myself into, and what footy meant to the Australian people and I loved every bit of it. At the lunch all the captains had to introduce themselves and talk about footy in their country, its progress and development. When it came to me, most were impressed with my line, which Dave Mathews brought up every time he saw me, "footy is India's new born baby given to us by the AFL and its our duty and responsibility to nurture it and watch it grow!” Needless to say, I was so nervous! I remember our first game of IC08, The Indian Tigers were making their debut against the Samoan Kangaroos. I wasn't overly nervous having been in a representative side playing rugby, but I could see most of my team mates were. I'm proud of them, they gave it their all and even though they had no match practice, each one tried and played to the best of their abilities. As IC08 continued we played New Zealand (defending champions), Japan, Finland and China. From game to game we got better and better and even put some points on the board. It was an enormous learning experience. Even though we didn't win any of our games we learnt a lot and played better, harder and got stronger. Through it all we made lots of new friends and tied greater bonds with each other which will last a lifetime. As for footy in India, I plan to keep to my word and nurture it and watch it grow! I'm sure with the second largest population in the world it shouldn't really be a problem. Me and my mates head out to the college ground sometimes and kick around the footy and a lot of on lookers are intrigued and eager to learn this new game and soon after the Puja Festive Season we are all looking forward to reviving the AFL practice sessions and introducing this new sport to our friends, family and even complete strangers! I have a lot of ideas; it’s just a matter of talking to the right people. I would like to thank everyone who has helped out the Indian Team, particularly our Runners; Yuta and Peter, our Assistant Coaches Laurie and David and the Melbourne-based boys, for without them putting up a team together would have been impossible."